Experience a beachside holiday in Legian, a resort town on the west coast of Bali, wedged between Kuta and Seminyak. Ride the waves off the coast, taking a course in any one of a number of water sports. The beach offers a long strip of soft white sand, with semi-raucous beach bars nestled among the palms and spilling out onto the coast come closing time. Local cultural sights include impressive temples and animal conservation areas, while the main thoroughfare offers a host of nightlife options and relaxing spas. 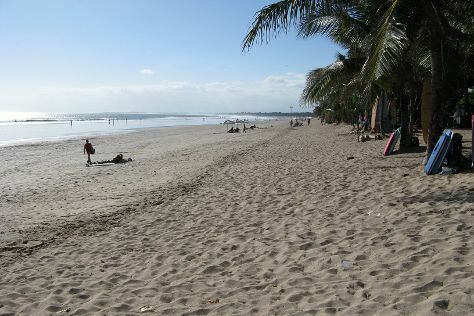 Legian is in Kuta District. Whether you only want to go to Legian, or have a whole adventure planned, Inspirock has you covered with our user-friendly Indonesia day trip planning app .